A silence settles across the Old Truman Brewery. Desk fans spin down as the PC Gamer team slide their way across a carpet of forgotten Dark Souls posters. Chris has vowed never to speak again after streaming eight hours' worth of convention, but assures the rest of us it was worth it in sign language. The PC Gamer Weekender is over, and a bloody good show it was thanks to the boundless enthusiasm for PC gaming you put on display. Phil requests a human sacrifice. I've been shovelling coal into the Weekender hype train for the past few months, yammering on about Dark Souls 3 this, incredible speakers that, so imagine my delight when you turned out in force to get your hands on with the Dark Souls, the Warhammers, and hopefully not the incredible speakers. The venue was bustling and the Vive was so popular the attendant just laughed at me when I asked for a go, but that was okay, because it made space for a near-violent game of Bass Fishing among friends (although, come to think of it, I missed the only 'Do you know who I am?!' opportunity I'm ever likely to get). You call that a bass? THIS is a bass. Thank you to everyone who came along, be it to test drive Dark Souls then head for the hills or stare at the £11,000 desk in a trance. 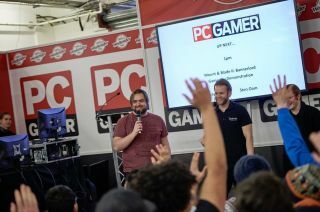 Thank you to our guest speakers, hardware boffins and exhibitors who drew in our visitors like PC gaming moths. We couldn't be happier with how the Weekender went, so watch this space—there's always more gaming to be done, and many more weekends ahead. But can it run Arkham Knight?